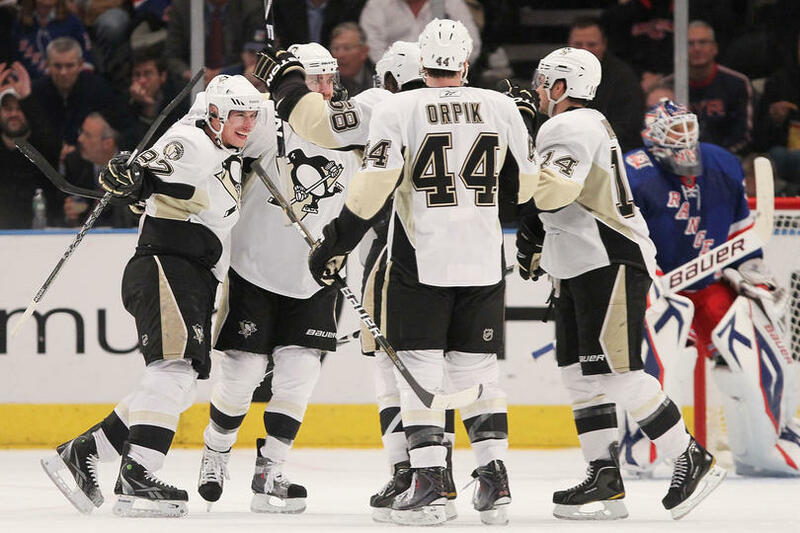 It was Monday night business as usual for the Pens when they came into MSG and efficiently dispatched of the Rangers to continue their march to the top. The score may have only been 3-1, but this was actually quite the dominating performance for Pittsburgh. In fact, had a few shots not hit the post the score could have very well been 6 or 7 to 1. But only the ones that go in count, and the Pens didn't waste a lot of time getting on the board. Maxime Talbot skated into the offensive zone after a Pascal Dupuis and picked the pocket of both d-men trying to corral the puck. Talbot surprised Lundqvist with a quick shot and bang...1-0 Pens. The only other significant happening in the 1st was Mike Rupp beating the stuffing out of Brandon Prust at the end of the period. 1st half of the 2nd period was also a whole lot of nothing, but then the Pens picked it up. Kris Letang took a ridiculous cross-ice pass from Sid and shot a dart past Lundqvist for his 5th of the year and Crosby's 13th straight game with a point. 3 minutes later Chris Conner wired one past Lundqvist for his 2nd of the season and 3rd career against NYR to essentially put the game out of reach. Gaborik did beat Fleury on a long-distance snipe a few minutes later and the Rangers had a chance to score at the end of the period, but Fleury and the D held the fort. The third period featured some solid Pens PK work and then some Sean Avery shenanigans. Avery dropped the gloves with Kennedy in the 2nd, but was still not satisfied. He went after Malkin, but then backed away with Engelland. Then he went for Crosby's legs, but again was nowhere to be found to answer the bell. It got so laughable that even Steigy and Bob had to join in on the fun, and the FSN listeners were "treated" to a Paul Steigerwald serenade. But enough about that. Pens never really looked uncomfortable with their lead, and the only disappointment of the game was that they couldn't get Sid out for the empty netter to pad his stats. The Rangers had a chance to pull within 1 at the end of the 2nd, but Fleury made some great saves and the defense held up to preserve the 3-1 lead at intermission. Offense: B+ Efficient, skillful, and got the job done. That's fine with me just about any day. Defense: B+ Gaborik did get his chances and those back-to-back 3rd periods on Engelland and Goligoski were not necessary, but overall they were pretty good. The Michalek-Martin pairing was solid. Fleury: A- The 1 goal looked soft, but it really was a tough one to stop. But even if it was, Fleury made enough good saves to earn the victory anyways. Powerplay: ? Only had 1 chance. Not enough to grade. Penalty Kill: A Solid as always. 3-3. -Maxime Talbot has been in playoff mode these last few games. Penalty killing, checking, and scoring as well as I've ever seen him. -Chris Conner was fantastic tonight. He scored, nearly had a chance to score again, and was a solid contributing member of the 3rd line. -Sid and Geno spent a lot of time together. They actually were paired together quite early, and the "2 headed monster" made on and off appearances throughout the game. Obviously good things happen when you put 2 of the best players in the NHL together, but I wonder why he went to them so early when he usually saves that move for the end.